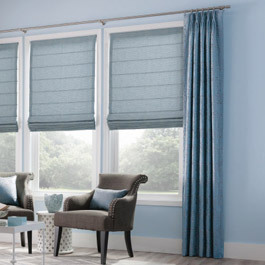 Blinds at Home gives you the ability to shop with the convenience of never leaving your home. At your Free In-Home Consultation, our design consultants will bring samples of products so that you can see what each type of window treatment will look like in its designated living space. They understand that choosing the right window treatments can be challenging and are here to provide you the best design advice, in the comfort of your home. Our professional consultants are trained to manage your window covering projects through every phase of implementation, from design and consultation to ordering and installation. All of our products are backed by the industry’s best warranty programs to fully guarantee your satisfaction. Whether you are looking for blinds, shades, shutters, or drapery we can offer an array of product choices for your style needs. We can expand your living area for all seasons by enclosing outdoor spaces, with our lines of outdoor solar shades and shutters. Our product specialists can provide options when you are looking for Energy Efficient Shades, Motorization, Anti-Microbial and Fire Retardant Shades, Skylight Coverings, and Child Safety Solutions. Contact our Design Consultants to help you create beautiful living spaces, while maintaining style and function. Schedule your Free-In-Home Consultation today!